The industry has long been accused of being a laggard insofar as the adoption of technology is concerned and some like to joke that not much has changed since humankind first picked up a plow 12,000 years ago. Nonetheless, the industry is on the cusp of significant upheaval. Technology, changing consumer tastes, business model innovation, radically different ways of working, shifting economic realities and lower barriers to entry are fundamentally changing the game and forcing real estate companies to rethink their business models. Proptech companies raised over US$12.6B in 2017, and the industry is tipped to become worth US$20B by 2020, as companies such as Purple Bricks (buying and selling), VTS (leasing management), Fundrise (crowdfunding) and SMS Assist (building management) begin to change the rules of the game. As the Greek philosopher Heraclitus put it, “the only thing that is constant is change”. Incumbents need to ready themselves for far more change than they’ve traditionally been built to navigate. Failure to do so is likely to result in extinction or at best, significant marginalisation. 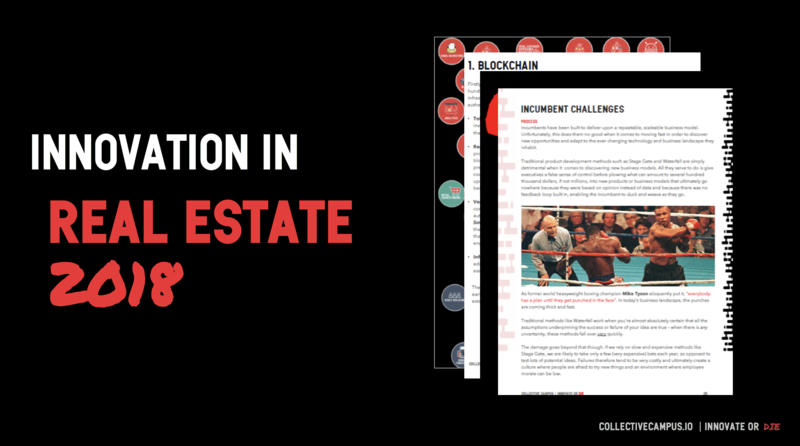 In this ebook, we provide a brief overview of Proptech, what it means for incumbents in the real estate industry and what they can do to best prepare and respond to these imminent changes to BAU.